There have always been discussions among hunters to what influences the timing of the rut. There are many theories out there, but none provide the factual information based off of physiological processes that occur in deer like photoperiod. Photoperiod is simply the change in the amount of darkness throughout a given day. Summer days are longer than winter days, based on the amount of light there is each day at these times of year. Deer take notice of these photoperiod differences throughout the year and as a result they trigger behavioral and bodily changes. 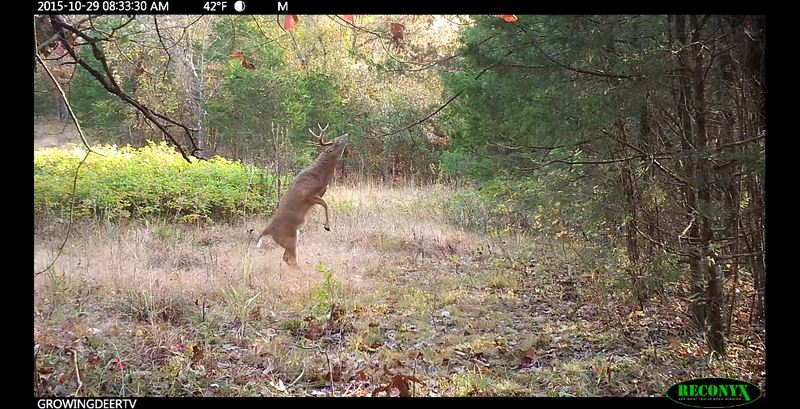 A mature buck we call Herman is active during daylight working a scrape during late October. As light fades from late summer into fall, deer sense this through nerves in their eyes. These signals travel into the brain and determine the amount of melatonin that is produced. When melatonin is produced it then creates a spike in testosterone in bucks and estrogen in does. It is widely known that both testosterone and estrogen are hormones that influence reproductive behavior. As you know from hunting through October and the time leading into the peak of the rut, bucks and does will exhibit rutting behavior. This can be observed through scraping activity. During early October when the days are longer, with less darkness, the scraping activity is less. However, during late October before actual breeding begins, scraping activity is extremely high. This is not simply ironic, as darkness increases during the month rutting behavior increases as well. Another important note on photoperiod is that the rate and timing of the photoperiod changes do not differ from year to year in a given location. This is why deer behavior on your Proving Grounds occurs routinely each year. You may not experience the same level or intensity of action each year, but remember weather determines daily deer movement. Warm spells during November do not mean does will not get bred, it may simply mean you may not experience the same rutting activity, but rest assured, the rut still occurs at this time. How does this help you as a hunter? Now you know what influences the timing of the rut. Most importantly you know that the influencing factor, photoperiod, does not change from year to year. As you prepare for the rut and schedule time off or time afield, I suggest you do so at the peak of pre-rut activity. The odds are in your favor the most at this time because bucks are chasing and have not yet been locked down by receptive does, offering more opportunity for you to cross paths with one of your hit list bucks. I hope you take the time to study and further read on photoperiod as it also determines many other important events for whitetails each year.